Detached clusters with strong central concentration. Detached clusters with little central concentration. Detached clusters with no noticeable concentration. Not well detached from surrounding star field. Most of the cluster stars are nearly the same apparent brightness. Cluster is composed of bright and faint stars. Poor (less than 50 stars). Rich (more than 100 stars). The letter 'n' following the Trumpler type means that there is nebulosity associated with the cluster. 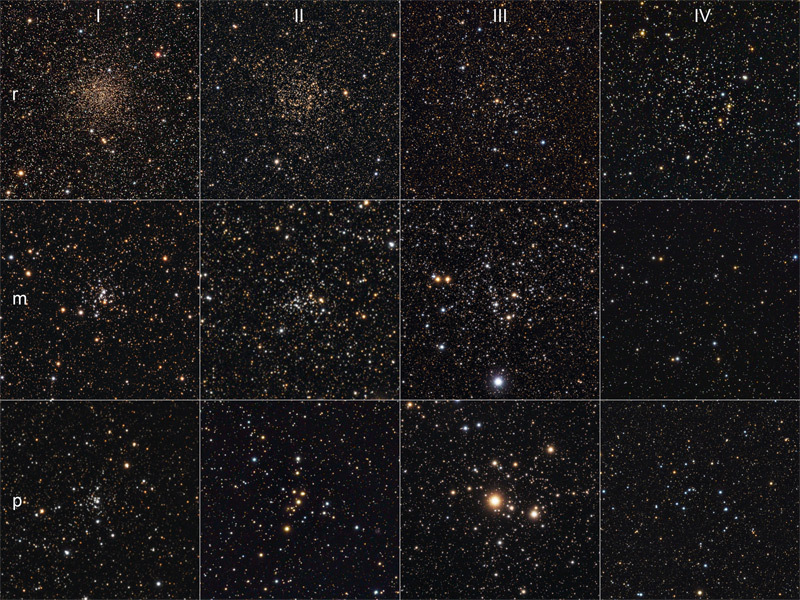 The above image shows twelve open clusters, sorted by the degree of concentration (horizontally) and sorted by the richness of stars (vertically). The range of brightness of all shown clusters is 2 or 3. The following links give detailed information about the cluster images.